These are a range of annual seed mixes using wild flowers from around the world. They are often referrred to as THROW & GROW mixes. They have been made popular by Councils. They offer a long season with a wide and dramatic range of exotic colours. They should be sown in the spring from March through to May. They are quick to grow and can provide a long colourful flowering season over the summer. This long flowering season is very beneficial to all natural pollinators such as Bees. We have four Throw & Grow mixes & three of the most popular species available as straights. Sow at 3 grams to the square metre. They flower throughout the summer. Species such as Cosmos. California Poppy and the French Marigold. These mixes will generally just last one season. On this page also is listed Borage and Sainfoin attractive plants much loved by bees. Best suited to fertile conditions. Sown into ground which has been cleared of competition and which is a fine level seed bed. To see full details of the mixtures click on the relevant description below. 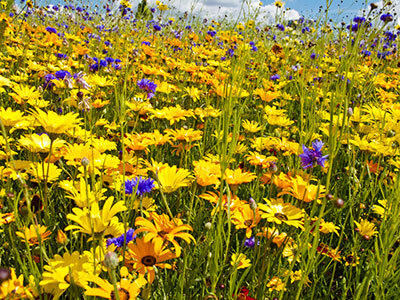 Wide range of annual wildflowers around the world. Colourful display that lasts for a long season. Sow March though to May. Has a long flowering season. Sow at 3 grams to the sq metres. Likes moist but well-drained soil. Sow March to May or August to September. Range of colours in the mix. Ornamental garden plant and a herb. Marigold can adapt to almost any soil. These are mixes of wild flower species from around the world. They are similar to the mixes sown by Councils. They are designed to be sown in the spring and give a colourful show from a wide range of annual wild flower species.